Austin Maynard Architects continues their valiant fight against the cookie-cutter McMansions of Australia with a beautiful new project built from recycled red brick. 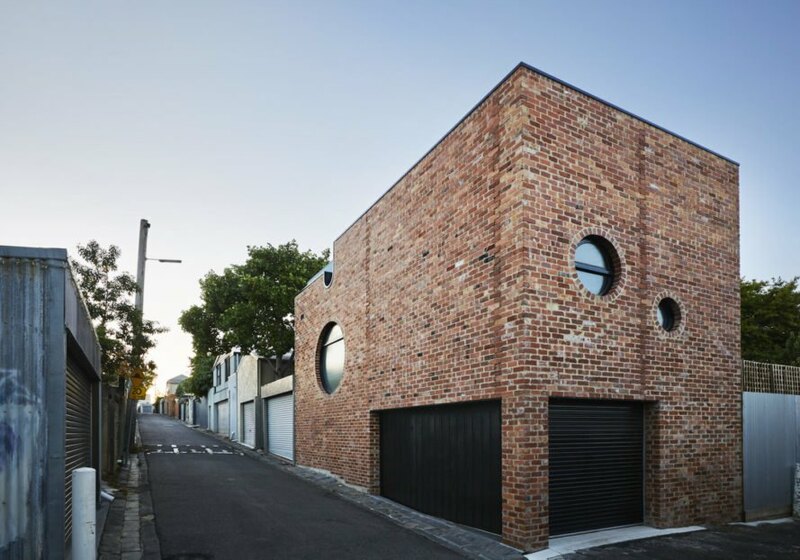 Located in Richmond, Melbourne within a laneway, the Brickface is a compact house addition at the end of the existing building’s rear yard. The modern and playful extension includes a garage on the ground level, a studio living/guest suite above, and a roof deck. Brickface stands out from its laneway neighbors thanks to its recycled red brick facade, large round windows, sculptural form, and garage doors that are painted black instead of white to recede into the building face. 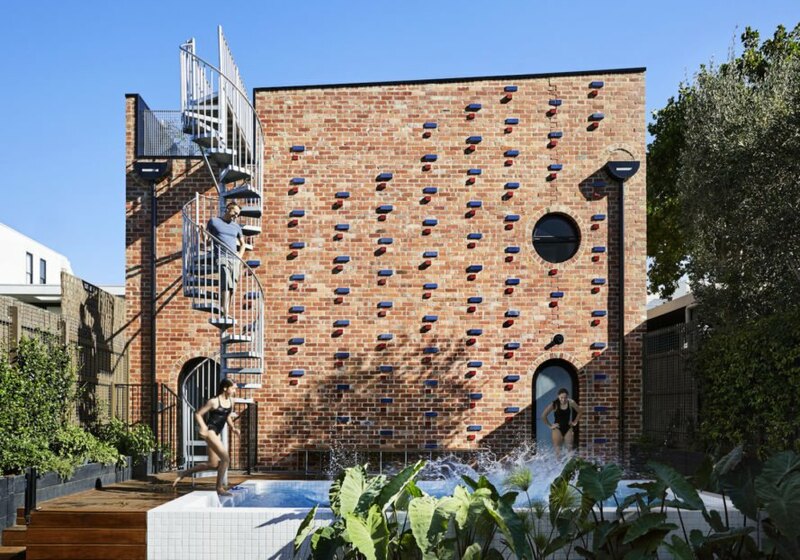 The side of the extension facing the main house features an eye-catching outdoor spiral staircase, as well as a playful extruded pattern of red and blue glazed brick from the PGH Vibrant range. 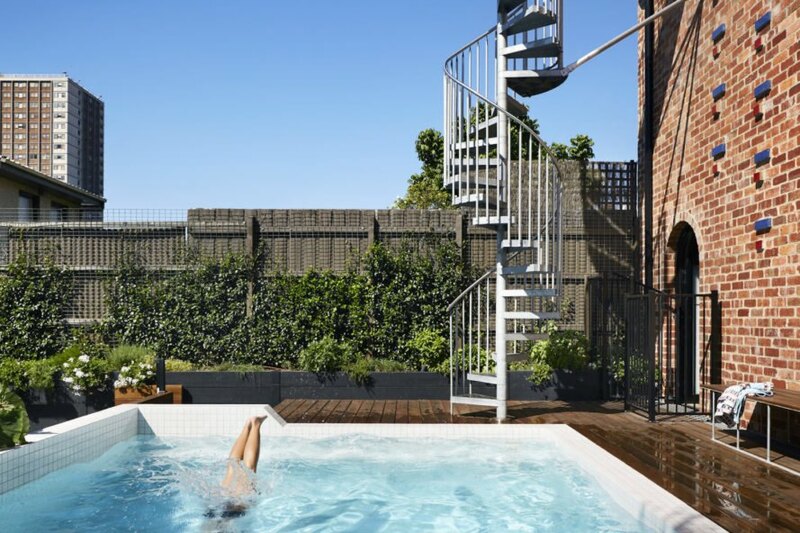 A new entertaining space with a pool and terrace was built between the existing home’s main living area and Brickface. Flexibility was built into Brickface’s design. The ground-floor garage can be easily adapted into a large living space or even an office. The high-ceilinged contemporary interiors are filled with natural light and the walls painted a bright light blue. The accessible roof terrace can be used for entertaining and as garden space. Austin Maynard Architects continues their valiant fight against the cookie-cutter McMansions of Australia with a beautiful new project built of recycled red brick. Located in Richmond, Melbourne within a laneway, the Brickface is a compact house addition at the end of the existing building’s rear yard. The modern and playful extension includes a garage on the ground level, studio living/guest suite above, and a roof deck. Brickface stands out from its laneway neighbors thanks to its recycled red brick facade, large round windows, sculptural form, and garage doors that are painted black instead of white to recede into the building face. 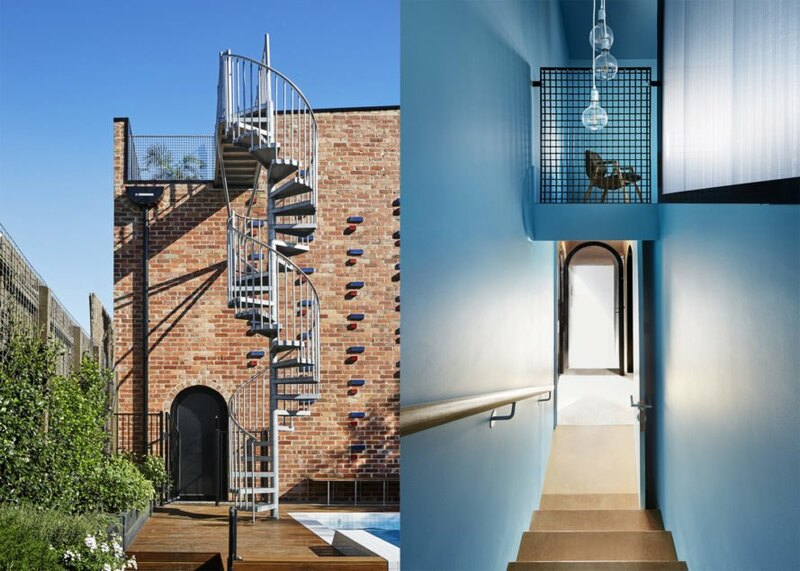 The side of the extension facing the main house features an eye-catching outdoor spiral staircase. 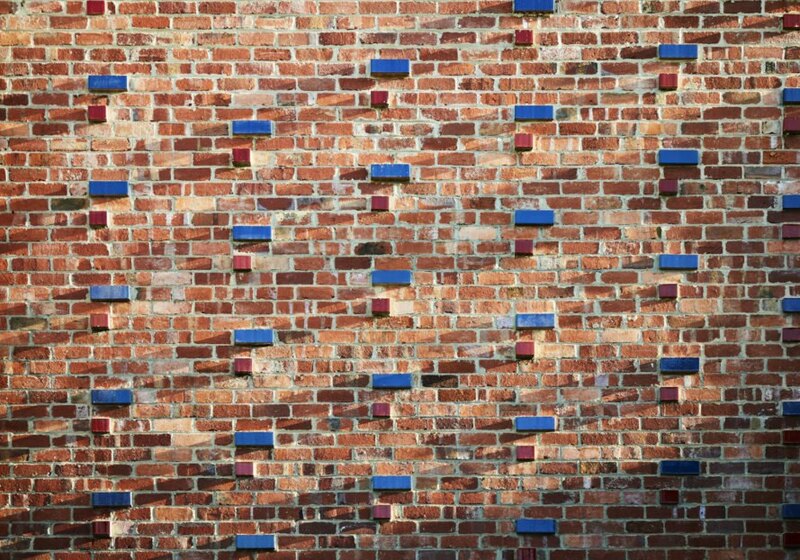 A playful extruded pattern of red and blue glazed brick from the PGH Vibrant range. 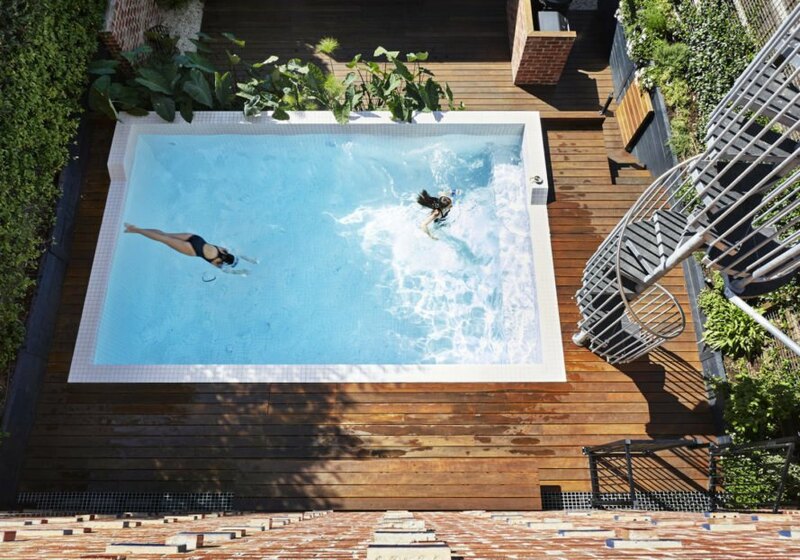 A new entertaining space with a pool and terrace was built between the existing home’s main living area and Brickface. Flexibility was built into Brickface’s design. The ground-floor garage can be easily adapted into a large living space or even an office. 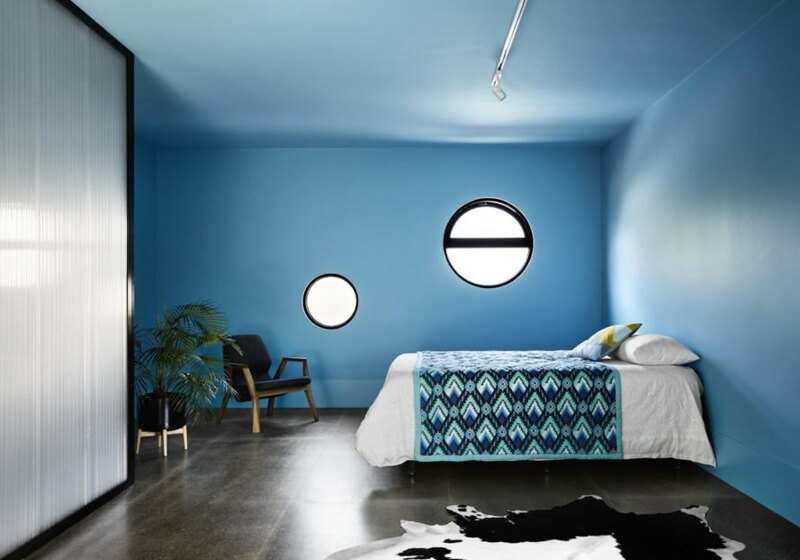 The high-ceilinged contemporary interiors are filled with natural light and the walls painted a bright light blue. The accessible roof terrace can be used for entertaining and as garden space.